The year is winding down, and it’s very unlikely Microsoft will announce another major product, so naturally, we need to look forward to 2019 and beyond. Brad Sams of Thurrot has plenty of delectable rumors in his new book Beneath a Surface. Some of his claims about Microsoft’s product roadmap reinforce things we’ve heard before, while other bits are entirely new. Microsoft declined to comment on Sams’ book, and the author himself warned us that a roadmap is never a totally accurate picture of what a company is going to release. But if he’s right, we’ve got a lot of fun stuff to look forward to. Both devices will be revisions to the 4K capable Xbox One S. The first will cut out the optical drive that allows you to play games and UHD Blu-rays. The other will be similar to the current Xbox One S, but start at a lower price. The Xbox One S, when it launched in 2016, started at $300. The display on the Surface Studio, and its recent successor the Surface Studio 2, is glorious, and the hinge that attaches the display to its stand and allows you to adjust it with no more than a finger, is a marvel of consumer electronics engineering. But as Sams notes, the price of that display alone has always been too high to warrant Microsoft spinning it off and selling it sans computer. Surface Studio had a starting price of $2999 and when I asked Microsoft following the announcement how much it would cost just to sell the display, they quoted a figure of about $2000. Knowing this, you can understand why Microsoft has yet to offer a standalone Surface display: The price would be too high. Sams claims that’s going to change in 2020 when Microsoft launches a third Surface Studio heavily informed by the Surface Hub smart display currently in the market. Essentially the Studio would become more modular, with different parts consumers can upgrade independently and even use without the other components. We’ve heard about Microsoft’s plans for a dual screen Surface-branded device for a while, and the company has been working on different iterations of dual-screen devices for over a decade. The latest version is code-named Andromeda and was rumored to launch this year. Sams now claims it will launch in late 2019 which isn’t that surprising. Microsoft made a big show of Windows 10'sdual-screen support at Computex in Taiwan this year. Sams notes the original version of Andromeda was an LTE-capable device that could fit in your pocket, but ZDNet’s Mary Jo Foley reported that Microsoft killed the project this year. According to Sams, the new device will be larger. Mark this one as virtually guaranteed. We’ve been hearing rumors of a refresh to the Surface Pro all year. The device will have slimmer bezels and gentle curves like the Surface Go. It will also have USB-C, which was glaringly absent from this year’s refresh. Interestingly, Sams claims Microsoft chief product officer Panos Panay is personally responsible for its absence on current Surface devices. 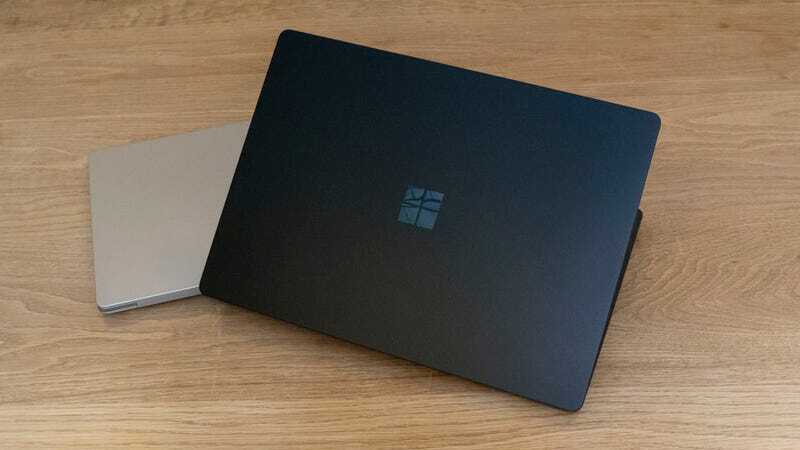 “With the company’s two previous Surface releases including USB-C, it was puzzling that the newer Surface Laptop 2 and Surface Pro 6 did not. This was especially true because these are the two Surface products that had sold in the highest volume in the previous years. Microsoft may delay the next batch of Surface devices owing to delays in producing Intel’s next x86 chipset, Ice Lake. Still, Sams suggests that Microsoft could experiment with working with other CPU makers again. Microsoft’s very first Surface, the Surface RT, had an ARM-based processor. But according to Sams the Intel relationship has driven Microsoft to stick mainly with Intel chips since then. Sams says that this year’s excellent Surface Go has a Pentium processor inside instead of a Qualcomm chip because of the importance of maintaining that relationship. However, that doesn’t stop him from later claiming that Microsoft could turn to AMD for a later Surface Laptop, which would appear in Q4 2019. Know further details? Feel free to email me at alex.cranz@gizmodo.com, DM via Twitter, or hit us up on SecureDrop.